Waterford Institute of Technology (WIT) has announced the second year of two bursaries for Agriculture and Agricultural Science students who intend to travel abroad as part of their work placement module. 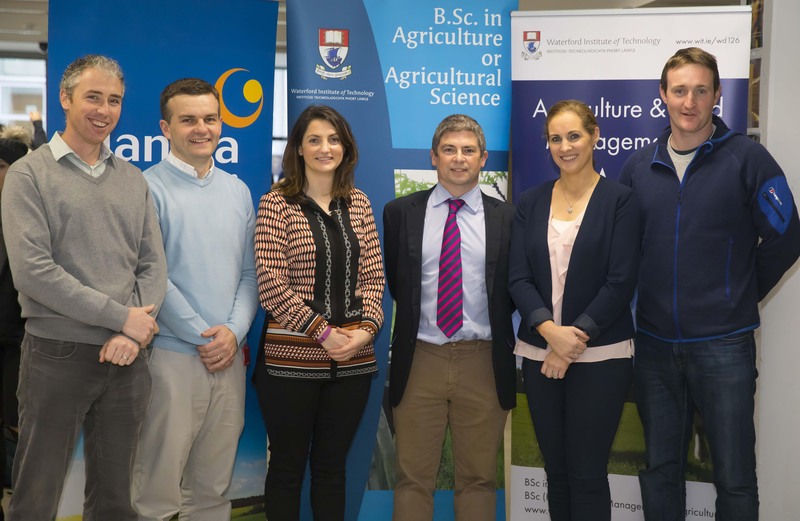 The ASA/WIT Travel Bursary in association with Irish Farmers Journal and Arvum Group for BSc (Hons) in Agricultural Science students and the ASA/WIT Travel Bursary in association with Irish Farmers Journal and Glanbia for BSc in Agriculture students were formally launched at an event held at WIT this week. Applications are open to all students within the two courses who intend to travel overseas for their farm placement. As part of the process applicants will be interviewed by a representative from each of the sponsor organisations and also John O’Connor from Teagasc Kildalton who is heavily involved in organising New Zealand work placements for all WIT ag and ag science students. Speaking at the launch of the ASA/WIT Travel Bursary in association with Irish Farmers Journal and Arvum Group for BSc (Hons) in Agricultural Science students, Arvum Group Technical Director Tim O’Donovan said, “The Arvum Group connects with WIT in many ways and we are particularly delighted to sponsor the WIT Agricultural Science Student Travel Bursary. This initiative encourages ag science students to think beyond Ireland, to gain more meaningful career and life experiences and to develop an international viewpoint. This set of skills and perspectives are highly valued by our company. We are heavily involved in agri-business and working with international partners and developing international business is core to what we do”. Commenting on the launch of the ASA/WIT Travel Bursary in association with Irish Farmers Journal and Glanbia for BSc in Agriculture students, Rob O’Keeffe, Marketing Manager, Glanbia Agribusiness said, “Glanbia Agribusiness are delighted to support the travelling overseas for work placement bursary in WIT's Agriculture Programme again this year. This international experience gives students a fantastic opportunity to develop themselves both personally and professionally. It enables students to gain real hands on exposure to different systems of agriculture in other countries which will really stand to them after they graduate”. ASA President Mary Delaney (who is also the Head of Equine for GAIN Horse Feeds which is the equine feed brand of Glanbia plc) expressed gratitude to the main sponsors of the farm placement travel bursaries. “This is a great initiative that the ASA are delighted to be involved in and we will continue to support and develop opportunities for the next generation of agri-food leaders.